የአባቶቻችን አምላክ ቸሩ እግዚአብሔር ለቤተ ክርስቲያናችን ሰላምና አንድነትን፤ ለሀገራችን ዕድገትና ብልጽግናን ያድልልን! 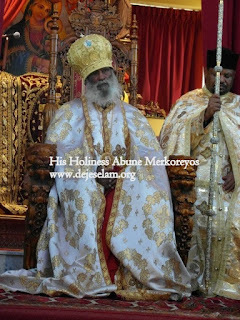 yehe tsihuf le orthodox tewahedo emenet teketye hulu yemidrsbet menged befaleg ttu new dejeselam gebto yemyanabew betam tikit sew new memanu degmo eye hone yalewn kalaweke degmo yegenzabe etret yenorale seleze ezhe website lye yemiwetu tsihuf hulu lememanu yedrse.melkmune zemene egziabher yamtalen amane. I completely agree with this article. This is the time to influence ( or encourage) in some way our fathers to obey the church's teaching. I want to say to our fathers and concerned body we are in your side if you do the right thing. But if betray the church truth(God)) as the politicians wants you to do. I tell you God will rectify it but you will have no place in our church. Respect politicians but fear God. ቅዱስ ሲኖዶሱ የማን ነው? የእኛ ነው ወይስ? ለእርቁ እንቅፋት እየሆነ ያለው ማን ነው? ከማይቀበሉት ፕትርክና የሚቀበሉት ምንኩስና ይበልጣል! “ከፓትርያርክ ምርጫ - ዕርቅና አንድነት ይቅደም” ስንል ምን ማለታችን ነው? 6ኛ ፓትርያርክ የመሾሙ ነገር እርግጥ እየሆነ ነው፤ አሁንም ዝምእንበል?